Italy is a family-friendly country and kids are welcome almost everywhere. Marhaba Italia will take care of your family suggesting the best activities for all, suitable for all ages. Moreover, available for our little travellers a team of expert nannies, to look after your kids while you are out. Here, few suggestions about how you can enjoy your holiday, making all the family happy. 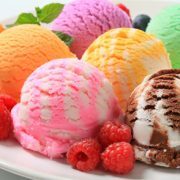 With this private Pizza Making and Gelato class, you will become a real Italian pizza maker, or “pizzaiolo” as well as learn the art of creating homemade gelato! Perfect for kids and adults, this class is designed for anyone with a passion for delicious food, having fun, and learning something new. Led by our seasoned English-speaking chef, this family-friendly cooking class is a truly unique and fantastic way to spend the day while you are on holiday in Italy! 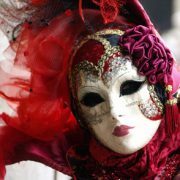 In Venice, mask wearing is a deeply rooted local tradition and symbol of the city. A private lesson includes a short history of mask making and wearing in Venice, followed by the chance to select and paint two masks from a wide array of shapes and size. 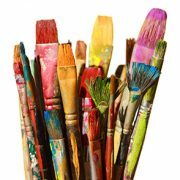 Bring your kids to enjoy an Art lesson in Italy to explore the creative half of their side! They can make their own little work on a canvas and take it back home! The classes take place in one of the cities’ magnificent locations like parks, villas or art galleries. An English-speaking instructor provides all the necessary materials. Italy has much to offer in the way of pure amusement and fun. While adrenaline enthusiasts can take a stab at wild and record-breaking rollercoasters and water coasters, the following parks hold attractions for all ages, even the very young: magic worlds, educational experiences, parades and performances that create unforgettable moments. In the Veneto Region, at Castelnuovo del Garda, we can find Italy’s famous Gardaland, one of the biggest theme parks in the country. Gardaland’s “Raptor” coaster ranks second in all of Europe for its number of loops, with 15 overturns or “upside-downs” at a speed of 55 mph. Its vicinity to Lake Garda and to Verona also means that visitors can plan several fantastic excursions all in one area. In Ravenna (Emilia-Romagna), fun-seekers can visit Mirabilandia. Among this theme park’s newest amusements, we can find “Divertical”, the tallest water coaster in the world – 197 ft in height and 68 mph. Less then 50 kilometers away from Rome lies Rainbow MagicLand: a mix of magical fun, fantasy and emotions. Castles, fairies and witches await in a park with 36 different attractions for the entire family, plus 10 performances and concerts every day. Italy’s top water park is Aquafan in Riccione, with 90,000 sq. m. of green overlaid with 3 km of slides. Visitors can get a good buzz on the Extreme River, Speedriul, Twist or Rapid River diversions. As for the little ones, they can enjoy three zones with tons to do: from the Cartoon Network beach, the Elephant Pool and the Antarctic Baby Beach, with slides and entertainment at just the right size. 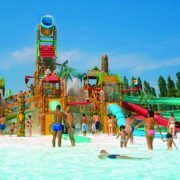 Near Rome is Zoomarine, named park of the year in 2010 and ranked as the third best amusement park in Italy. Here they put on excellent shows with dolphins, marine lions, seals, tropical birds and birds of prey, and divers. Excitement and fun are guaranteed, with a maximum capacity of 4,000, a 4D cinema, merry-go-rounds and roller coasters. This park really goes above and beyond, even boasting a tropical sand beach and the incredible interactive tour“Age of the Dinosaurs”, which features a prehistoric forest populated by life-scale animatronic dinosaurs. It is the first non-profit and privately owned permanent museum entirely conceived for children, schools and families, open to public since 2001. The Museum offers children an opportunity to play, experiment and learn in the field as well as occasions for socialization and education; it also promotes the development of children’s cognitive and emotional capacities. In the heart of Rome midway between Villa Borghese and Piazza del Popolo, an area of 8,000 sqm, which the Rome town council granted to the Children’s Museum, has been restored and redeveloped with the support of private companies and state institutions involved in a major fundraising drive. 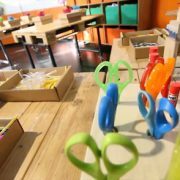 EXPLORA consists of the museum’s exhibit pavilion, a free-access green area which includes a well-equipped playground, a kitchen dedicated to food education workshops, a bookshop, a gift shop, a cafeteria, a restaurant and a parking area…a guaranteed amusement for the entire family. 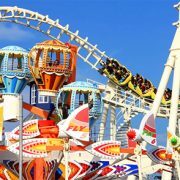 Marhaba Italia is here to help you choosing the best amusement for your family. If you did not find what you wished, write us an email, we will be happy to help you finding the best solution for you and your family.